As Notre Dame continues to recruit and haul the best from the “isn’t that so-and-so’s kid?” end of the pool, things like this are bound to happen, but today’s news out of California provides an interesting example of what happens when blatant bias against the Irish intersects with celebutante news. Cordell Broadus, son of Snoop Lion a/k/a Snoop Dogg, and four-star wide receiver recruit, is among several players suspended for a fight that occurred during a game between Diamond Ranch and Diamond Bar High Schools. Broadus, a junior at Diamond Bar, allegedly cheap-shotted an opposing player, fomenting the fracas. The original story, from TMZ. com, can be found here. Now, if you decided go to Bleacher Report, you find the headline: RAPPER SNOOP DOGG’S 4-STAR SON, NOTRE DAME RECRUIT SUSPENDED FOR FIGHTING (which I won’t link to restrict traffic to the click-bait). Below the headline? 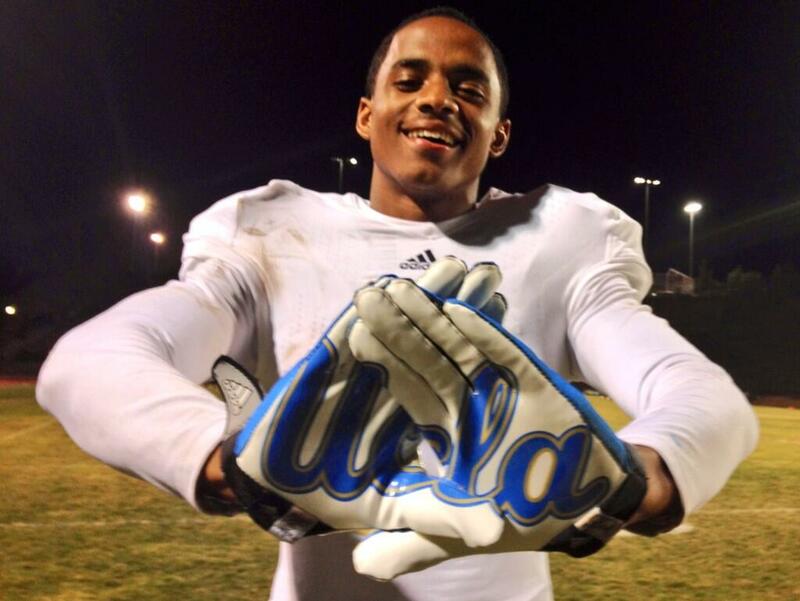 A photo of Cordell flashing his UCLA gloves. Cropping photos is fun, isn’t it B/R? Interestingly, Broadus has offers from Southern Cal, LSU, and Nebraska, too. But they don’t bait clicks so much, do they? Filed Under: Notre Dame Football, Recruiting Tagged With: Cordell Broadus, Lazy Sports "Journalists"